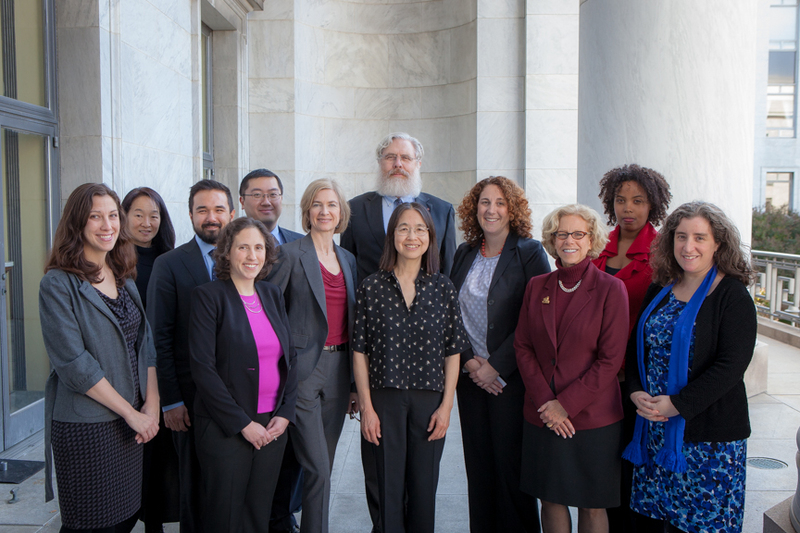 Johnny Kung, Director of New Initiatives for the Personal Genetics Education Project (pgEd), fills us in on their latest Congressional briefing. A version of this post is published on the pgEd website and is posted here with permission. 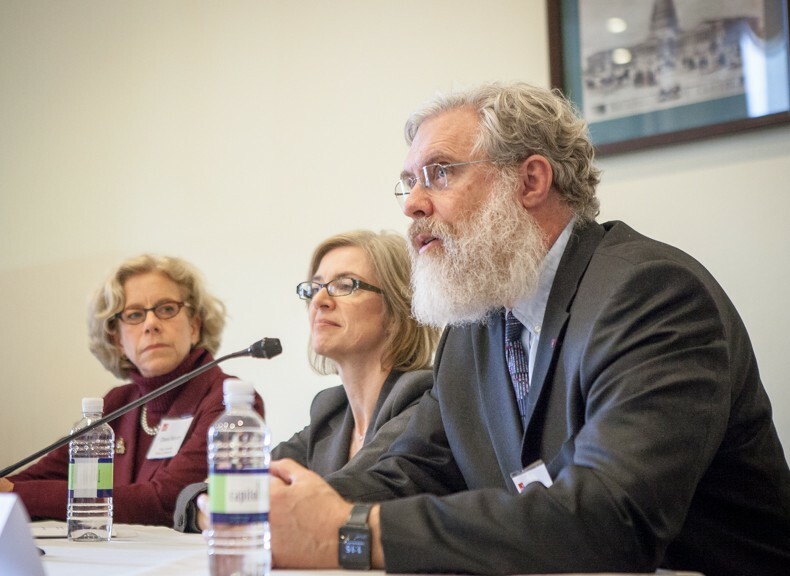 On Nov. 17, our group, the Personal Genetics Education Project at Harvard Medical School, held a Congressional briefing on Capitol Hill about the latest developments and applications of several emerging genetic technologies. This briefing, co-hosted by Congresswoman Louise Slaughter (D-NY25) and Senator Elizabeth Warren (D-MA), was our fourth in a series aimed at engaging the country’s policymakers on the importance of education and society-wide conversations about the promises and implications of genetics. Over the course of our briefing series, we’ve seen increasing interest in these topics in the Washington, DC, community, as evidenced by an audience size that has grown substantially. We sense that much of this success is due to our efforts to go in with the sole goal of informing and having a conversation, rather than advocating for any particular position or policy. At this briefing, three pioneering scientists – Drs. Diana Bianchi (Tufts University School of Medicine), Jennifer Doudna (UC Berkeley) and George Church (Harvard Medical School) – spoke about technologies ranging from non-invasive prenatal testing (NIPT), CRISPR gene editing, to DNA nanotechnology. At the same time, the speakers raised questions regarding the technologies’ social, ethical, commercial, and policy implications, which will need to be answered collaboratively by all stakeholders, and emphasized the importance of public engagement. The standing-room only event was attended by over 150 staffers from Congressional offices, various government departments and agencies, academic and professional societies, and other members of the public. Also in the audience were Drs. Mildred Cho (Stanford University, and a speaker at one of our previous briefings), Allison Werner-Lin (University of Pennsylvania) and Fr. Kevin FitzGerald (Georgetown University), who shared their bioethics and social science expertise during the lively discussions following the presentations. pgEd’s education director, Dana Waring, opened the briefing by introducing our mission – to raise awareness and foster discussion among the broadest possible cross-section of society, regardless of ethnicity, geography and economic status, for the safe and fair integration of genetic technologies into society. Dana gave a short overview of the range of our efforts to reach a wide audience, including through high schools, libraries, religious communities, the Internet (including an online quiz platform called Map-Ed), and even Hollywood. The floor was then turned over to Dr. Bianchi, who talked about the science behind NIPT and its integration into clinical practice. Remarking on the rapid growth in the use of NIPT (over two million such tests have been performed in the US since 2011), she discussed the current data on the performance statistics of these tests (criteria such as specificity and positive predictive value; for definitions of these terms, please refer to the information briefs we prepared to accompany the briefing). Dr. Bianchi noted that, given the rapid pace of NIPT’s development, there is a knowledge gap for physicians which is currently being filled by industry representatives selling these tests. She is particularly concerned about how to provide adequate and accurate information to expectant parents who, due to the dearth of genetic counselors in the country, may otherwise not have access to proper counseling on how to deal with the test results. She suggested that online educational applications might be one possible way to address this issue. Dr. Doudna then introduced CRISPR, a molecular biology tool for “editing” DNA that has generated much excitement for its uses in research and clinical applications. She reviewed the history of CRISPR’s discovery, which began as curiosity-driven basic research about how bacteria fight off viruses. Present and potential applications of gene editing include agriculture, screens for pharmaceutical drug targets, disease vector control, and gene therapy. For this last possibility, the major challenge will be to safely and efficiently deliver CRISPR components to the cells in the body where the therapy is needed. Dr. Doudna noted that delivery might be less difficult for gene therapy performed on the germline (reproductive cells and embryos, for which the genetic changes will be inherited by every cell in the individual and subsequent generations), but that using gene editing in such a way is also much more ethically controversial. She stressed the importance for both academic and commercial scientists to engage in public education and encourage open discussions about how to move forward with this technology. Dr. Church rounded out the talks by overviewing recent developments in genetic technologies for “reading”, “writing” and “arithmetic”. Improvements in DNA sequencing and data interpretation have led to a million-fold decrease over the past decade in the cost for “reading” the human genome, facilitating the advance of “precision” or “personalized” medicine. Going forward, focus will need to be placed on public education as well as on working out how data is to be shared so as to help push forward DNA-based disease diagnosis. On “writing”, Dr. Church discussed two potential applications of our newfound ability to make precise changes to DNA using gene editing. In one case, the technology might make it possible to “humanize” pigs for organ transplants — more accurately, to remove viral sequences found naturally in the pig’s genome that might otherwise pose health risks to transplant recipients. Another speculative application involves using “gene drives”, where CRISPR is used to “drive” the efficient spread of a genetic element throughout a population (see the information briefs for more detail), to alter the animal vectors of infectious diseases (such as mosquitos for malaria). The hope is that, by breaking the pathogens’ life cycle, such infectious diseases might one day be eradicated. Finally, on “arithmetic”, Dr. Church described how the properties of DNA allow it to be used as digital data storage and “smart nanotech” (such as “nanobots” that can deliver drugs to desired target cells in the body). Following the presentations, the floor was opened for discussion. Audience members asked a variety of questions on both the scientific aspects of the various technologies – such as the difference between CRISPR gene editing and current methods of genetic engineering using recombinant DNA, or whether the disease vectors could develop resistance to gene drives – as well as the social and policy aspects – e.g., how genetic counseling might have changed in response to these new technologies, and what kinds of funding and regulatory policies might facilitate the technologies’ translation from the lab to actual applications. All three speakers affirmed the importance of collaborations between scientists, on one hand, and ethicists, social scientists, and experts in the humanities to address the ethical and social issues related to their research. Dr. Doudna brought the discussion to a close by encouraging all interested parties to attend the international summit on gene editing at the US National Academies, to be held on Dec. 1-3, 2015, to take part in the very important discussions around this powerful new technology. After the briefing, the three speakers, along with pgEd’s director, Dr. Ting Wu, and director of programs, Dr. Marnie Gelbart, met with the White House Office of Science and Technology Policy (OSTP). In the more informal setting of the OSTP, the speakers and our team continued the discussion about these emerging genetic technologies, as well as pgEd’s mission of raising public awareness about issues surrounding personal genetics. Capping off the day’s events, we were honored to be joined by Congressman Bill Foster (D-IL11) and Congresswoman Jaime Herrera Beutler (R-WA3) at dinner with the three speakers.